INSIDE FACTS AS TO ITS ORGANIZATION.—A DE FACTO BODY.—THE REAL T.S. IN NEW YORK.—THE PRESIDENT STILL A DELEGATE TO FOREIGN LAND, AND HOLDING OVER IN OFFICE. These facts are extracted from a paper prepared for the Convention at Boston in April, 1895. The historical documents and records used in the preparation of the matter are: the original minutes of the T.S. ; the original constitution; the records published in India, Europe and America from time to time; Old Diary Leaves—not considered however as wholly reliable—original documents drawn up and signed as far back as between 1875 and 1878. 1. At a meeting held in the room of H.P. Blavatsky, 46 Irving Place, New York City, September 7, 1875, it was agreed to form a Society for the purpose of Occult Study. Upon motion of William Q. Judge, Henry S. Olcott was elected Chairman of this meeting, and upon motion of H. S. Olcott, William Q. Judge was elected Secretary of the same. Adjourned to September 8, 1875. This is asserted as the facts by those who were present. 2. Pursuant to adjournment, a meeting was held at the same place September 8, 1875. It is with this meeting that the minute book begins. Upon motion of William Q. Judge it was voted that H. S. Olcott take Chair, and upon motion it was voted that William Q. Judge act as Secretary. Upon request of the Chair, sixteen persons handed their names to the Secretary, as agreeing to found and belong to such a society. A committee of four, including the Chairman, was appointed “to draft a constitution and by-laws and to report the same at the next meeting”. Adjourned to Monday, September 13, 1875, at the same place. 3. Pursuant to adjournment, a meeting was held September 13, 1875. H. S. Olcott acted as Chairman and C. Sotheran as Secretary. The Committee on “Preämble and By-laws” reported progress. It was resolved that the name of the Society be “The Theosophical Society”. The Chair appointed a committee to select meeting room. “Several new members were nominated and upon motion those persons were added to the list of Founders”. The meeting adjourned subject to the call to list of the Chair. 4. Pursuant to notice dated at New York, October 13, 1875, signed Henry S. Olcott, President pro tem., a meeting was held at 206 West 38th street, October 16, 1875, “to organize and elect officers”. Eighteen persons were present. The report of the Committee on “Preämble and By-laws” was laid on the table and ordered printed. The meeting adjourned to October 30, 1875, at the same place. H. S. Olcott was Chairman, and J. S. Cobb Secretary. 5. October 30, 1875, the Society met pursuant to adjournment. Mott Memorial Hall, 64 Madison Avenue, New York City, was selected as the Society’s meeting place. By-laws were adopted, but with the proviso that the “Preämble” should be revised by a committee and then published as the “Preämble of the Society”. Officers were elected as follows: President, Henry S. Olcott; Vice-President, Dr. S. Pancoast and G. H. Felt; Corresponding Secretary, Mme. H. P. Blavatsky; Recording Secretary, John Storer Cobb; Treasurer, Henry J. Newton; Librarian, Charles Sotheran; Councillors, Rev. J. H. Wiggin, R. B. Westbrook, LL.D., Mrs. Emma Hardinge Britten, C.E. Simmons, M. D. and Herbert D. Monachesi; Counsel to the Society, William Q. Judge. Adjourned to November 17, 1875. 6. The Society met in Mott Memorial Hall, November 17, 1875, pursuant to adjournment. The President read an address and after that the transaction of business, adjourned to December 15, 1875. 7. It is probable that Col. Olcott selected this as the date of organization, because of his inaugural address, but it is not correct, and he had no authority to do so. About this time members fell away and there was no quorum. 8. A few odd meetings were held until 1878. The minute book was mislaid. Resolutions were made by two or three persons writing them out and declaring them passed. 9. In the year 1878 H. P. Blavatsky and H. S. Olcott were appointed a “Committee of the Theosophical Society” to visit foreign countries and report. The Theosophist for October, 1879, vol. i, No. I, p. I, first item, says: “For the convenience of future reference, it may as well be stated here that the Committee, sent to India by the Theosophical Society, sailed from New York December 17, 1878, and landed at Bombay, February 16, 1879, having passed two weeks in London on the way”. In the Theosophist for January, 1880, vol. i, p. 95, Col. Olcott says he “came to India with two English colleagues and their learned Corresponding Secretary, Madame Blavatsky. They came only expecting to study Eastern Religion and Yoga Vidya and report their discoveries to the Western Theosophist”, which were the Society in New York, consisting of over forty members at the time. 10. Before the departure of their Committee to foreign countries, the Theosophical Society elected General A. Doubleday as President pro tem., to serve during the absence of the President. This election of President pro. tem. was never revoked; nor was the appointment of this Committee. On arrival in India H.S. Olcott had their picture taken and sent to America endorsed by him “The Delegation to India”. 11. Meeting of the Theosophical Society were held at New York for some years after departure of the Committee, and were presided over by General Doubleday and William Q. Judge. 12. From October 30, 1875, December, 1878, all alterations of the By-laws were made in regular and formal manner, by the Society in New York. 13. These By-laws provided that new members could not be elected until after thirty days consideration of their application. 14. The original organization was kept up at New York certainly until after January 1, 1882. 15. What purported to be “Revised Rules of the Theosophical Society” were adopted at Bombay in October, 1879, by a body which called itself the “General Council of the Theosophical Society”, but had no legal existence whatever. There was published in the Theosophist for April, 1880 (vol.i, p. 179): “The Theosophical Society or Universal Brotherhood. Principles, Rules, and By-laws as revised in General Council, at the meeting held at the palace of H.H. the Maharajah of Vizianagram, Benares, 17th December, 1879”. To this was subjoined the statement: “Revised and ratified by the Society, at Bombay, February the 26th and 28th, 1880.—Attest: Kharsedji N. Seervai, Joint Recording Secretary”. This meeting at Benares was merely one held by H.S. Olcott without notice and was irregular. It was here that Col. Olcott worked out the resolution that declared him President for life. The original Constitution fixed his term at one year and was never amended. The so-called ratification at Bombay was irregular and amounted to nothing. 16. None of the admissions to membership nor any alterations of the By-laws adopted at the instigation of the Committee sent to foreign lands were in accordance with the By-laws of the Theosophical Society in force at the time. The legal By-laws were adopted by a vote of the Society in New York and could only be changed by a like vote. None of these alterations of the By-laws were ever submitted to the Society in New York and that Society never voted on any of them. 17. From December, 1878, down to present time, various sets of “Rules”, “By-laws”, and “Constitutions” have been promulgated by alleged “General Councils”, but none of them have ever been adopted in accordance with the only By-laws of any validity. 18. No laps of time, no passive assent, and no active assent given in ignorance of the legal status of the case, would confer any validity upon the otherwise illegal acts of the President or of the Committee to foreign lands or those claiming to act through or under them, or either of them. 19. Up to 1880 members were admitted to the Society in New York in accordance with the By-laws. 20. Before H. S. Olcott and H. P. Blavatsky went to India the name of the Society was altered in New York, in the manner which prevailed after members had dropped off, to “The Theosophical Society of the Arya Samaj of Arya Vart”. This made it a Branch of the Arya Vart, over which Dyanand presided. Diplomas were printed thus and issued as late as September, 1878, with Dyanand’s name and seal printed on them. 21. In India, again, Col. Olcott, in the same manner as before, altered the name of the Society back to the old style by striking off “of Arya Samaj of Arya Vart”. If the Society properly voted to change in New York to Arya Samaj, it certainly never voted to reconsider. 22. Before the departure to India in 1878 the Recording Secretary was sent to London to form the British Theosophical Society. He did this and Dr. Wyld presided over that for a time. This body finally became, it asserted, the “London Lodge”, now controlled by Mr. Sinnett. 23. The London Lodge has always claimed to be autonomous, has continued its work, always claiming to be perfectly independent of the President, the parent Society, the Section in which it is, the Constitution, and all and every person and body whatever. This anomalous position has been always recognized and permitted by the President, and also by the European Section in which that Lodge is. This is finally exhibited in the letter from the Lodge, found in the Proceedings of that Section for 1894. 24. When H.P.B. for the last time settled in Europe, she autonomously, independently, and at the request of the Europeans (except the London Lodge), founded “The Theosophical Society in Europe”, of which she was President. After she had made her declaration, Col. Olcott issued a paper so as to seem to approve of what had been done. On these was built up the present European Section. 25. An examination of the records from the beginning to the end of 1893 shows that there is no record whatever of the election of William Q. Judge as Vice-President of the T.S. In July, 1894, at London, Col. Olcott and the Indian General Secretary upon William Q. Judge’s raising the point, decided that they would assert that the record was defective and could be cured by stating the fact that such Vice-President had been elected in India many years before, and it was so ordered in Council. But as the meeting at with said elected took place—if it ever did—was not one participated in by those who could bind the whole Society, and as the real T.S. existed in New York, if anywhere, it follows that William Q. Judge was not regularly elected Vice-President. The following by Col. H.S. Olcott occurs in a letter from him to W.Q. Judge, dated May 17th, 1893: “If you want separate T.S. Societies made out of Sections, have them by all means: I offered this years ago to H.P.B., and even to A.P.S[innett]”. In July, 1894, at London, he enunciated the same idea and plan to W.Q. Judge and Dr. Buck, after the dismissal of the Committee. (a) The present existing so-called “General Council of the Theosophical Society” was merely a de facto status and not a legal one, as it has grown out of and upon wholly illegal proceedings. (b) The By-laws adopted October 30th, 1875, and such amendments thereto as were made according to the terms of those By-laws, are the only legal ones at present in force and the only ones having any validity whatever. (c) The Theosophical Society formed at New York in 1875, never had any legal existence outside of the United Stated and cannot have except upon amendment of the By-laws. (d) The Theosophical Society was founded at New York, September 8, 1875, by some eighteen persons, and there was no such Society founded November 17, 1875, that being simply the date upon which the President delivered his inaugural address. (e) The present existing so-called “Theosophical Society and Universal Brotherhood”, with its officers and “General Council”, has no legal connection with “The Theosophical Society” founded at New York, September 8, 1875. (f) The authority of the so-called “General Council of the Theosophical Society and Universal Brotherhood” over members, Branches, and Sections, who have submitted to it in ignorance of the real facts in the case, exists only so long as its authority is not called in question, but when so called in question it ceases to have any lawful authority whatever. NOTE. A diploma made and issued in due form in 1883 to a member in St. Louis, was signed by Gen. Doubleday as President pro tem., and William Q. Judge as Recording Secretary. This shows the Society as then active in New York. We will print next month a reproduction of this diploma. On the opposite page will be found a photographed copy of a diploma made and issued in due form in Jan., 1883. 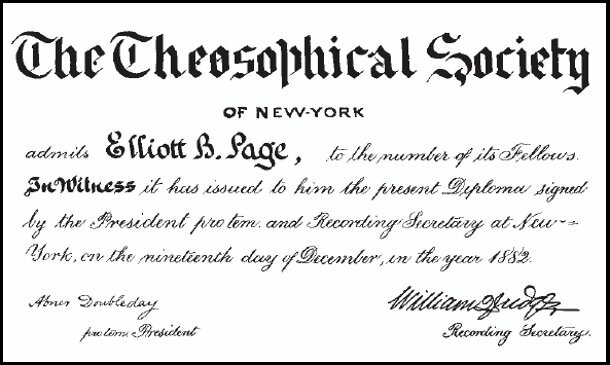 This is the diploma we referred to in an article in May issue under the title “The Theosophical Society.” It is of course only one of many, but is introduced here to substantiate the statement in that article that the parent T.S. was active in New York as late as 1883, Abner Doubleday being then its President pro tem in the absence of Col. Olcott, the delegate to India.